At the Embedded World tradeshow, Cypress announced that Continental is going to use the Traveo II family for several body control units. The MCUs provide multiple CAN FD interfaces. Continental selected the MCUs from Cypress for its next-generation body electronics platform. The products will be used in the central body control modules as well as in door, window, and sunroof control units. Other applications include seat control units, smartphone terminals, and wireless power charging units. "Global vehicle manufacturers rely on Continental for automotive systems that enable cutting-edge features to address the market's latest trends, such as firmware over-the-air updates, and with increasingly higher standards for reliable performance," said Michael Crane, Vice President, Body & Security, North America, Continental. "The strong performance and scalability of the Traveo II family made it stand out as the right choice for our next-generation body electronics platform. Cypress has established a strong track record as a partner to Continental, proving their design expertise and backing their portfolio with responsive support." "In my years working with Continental, I developed a deep appreciation for the precision, innovation, and quality the world's automakers demand to differentiate their vehicles," said Hassane El-Khoury, President and CEO at Cypress. "This platform order marks a significant step forward for Cypress' automotive portfolio and our new Traveo II family. 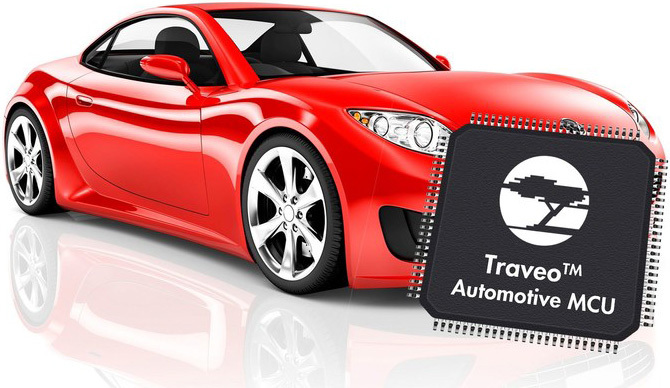 Our Traveo MCUs have earned Cypress a leadership position in the automotive cluster market, and we intend to earn a leading position for body electronics with our Traveo II family." The multicore Traveo II family is based on ARM Cortex-M7 and -M4 cores with up to 8 MiB of embedded flash. Featuring multiple peripherals, including support for CAN-FD, Ethernet, and Flexray communication protocols, the MCUs offer scalability and pin-compatibility from the low-end to the high-end. The family provides low-power consumption with a deep-sleep mode and security functions. The products are backed by Autosar (Automotive Open System Architecture) software. The companies exhibit its products at the Embedded World 2017.